Pronto pups, cheese curds, and Fulton! L-31 – While checking out a horse show at the Lee and Rose Warner Coliseum, you can grab a bottle of Lonely Blonde at the concession stands inside. V-12 – Giggles Campfire Grill, Located at Cooper St. & Lee Ave. in The North Woods, will have Sweet Child of Vine on Draught. Stop by for a beer on their brand new, and beautiful, Timber Frame patio, and grab a few of their famous walleye cakes or an Elk Burger while you’re there. K-27 – Coasters, Located on Liggett St. & Carnes Ave, will be serving bottles of Lonely Blonde. M-27 – Café Caribe, Located on Carnes Ave. & Clough St., will be pouring Sweet Child of Vine to pair with their delicious crab cakes, taco slider trio, and the live music playing on their stage in the back. K-27 – Frontier Bar, Located on south side of Carnes Ave. between Clough St. and Liggett St., will be serving bottles of Lonely Blonde. Saddle up partner. 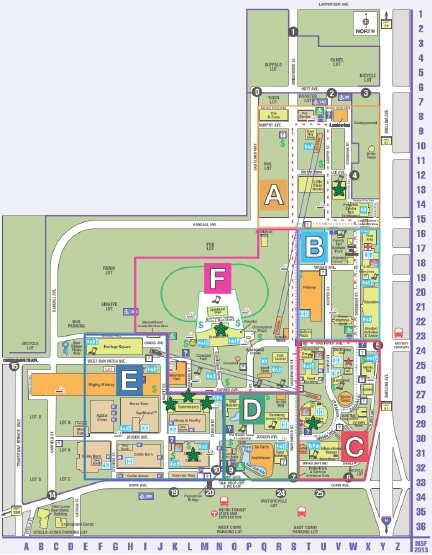 N-21 – Planning on checking out a show at the Grandstand this year? Well, you can get a Sweet Child of Vine on draught in the Minnesota Craft Beers section on either side of the stage while you’re there. T-28 – The Minnesota Craft Brewers Guild will have the same spot as last year in the West Hall of the Agriculture Horticulture Building. They’ll be serving up some education regarding the role of the Minnesota Craft Brewers Guild along with interactive and static displays showing the brewing industries longtime linkage to Minnesota agriculture and heritage. The science and process of brewing beer will also be displayed, and individual craft brewers from around the state will be on site to discuss their unique brews and breweries (we’ll be there talking this Saturday at 6:00). Oh, and they’ll also have flights of a variety of Minnesota craft beers available for sale. Not a fan of the fair? Really? Well, we’ll just assume that you moved to Minnesota recently, and we’ll give you some time to come around. In the meantime, you can stop out to Sea Salt this weekend for a Fulton Patio Party! We’ll have a tap trailer parked outside on Friday and Saturday, from 11:00 – 9:00, pouring Lonely Blonde, The Ringer, Sweet Child of Vine, and Fulton Mild. 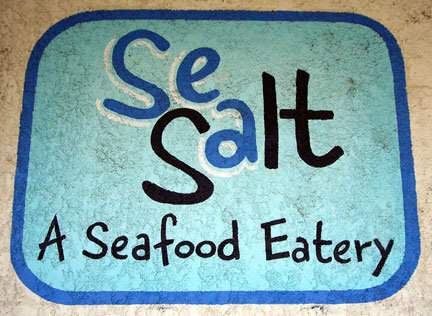 A softshell crab sammie or catfish Po’Boy, and a few afternoon beers at Sea Salt? You didn’t really want to head back to work after lunch, did you? You’ll never guess the secret ingredient! ale may be Lonely, but you certainly won't be! could halve the recipe to make less, but...why? Preheat oven to 350°F. Grease and set aside 3 square baking pans, or 2 9x13” pans, 3 9” cake plates, or 1 giant bar pan. high for 1 minute to partially melt butter. with a second bottle if necessary. 3.) In an electric mixer, beat the partially melted butter on medium until smooth. 4.) Add eggs, one at a time, mixing after each addition to incorporate fully. grown again (plus, now it smells awesome!). altitude conditions, you may need to slightly reduce the amount of flour). blows, we all agreed that the best solution would be to just add both. bars from the pan (if you want them to look pretty on a serving plate, that is). JOIN US AT OUR PATIO GRAND OPENING TOMORROW & TRY EVERY FULTON EVER MADE! BIG WEEKEND IN THE NORTH LOOP! The North Loop neighborhood is the place to be this weekend. On Friday, we're finally christening our newly-finished patio with a grand opening celebration. If you're still thirsty after that, Saturday is an even bigger day, with not one but two festivals in the North Loop. Read on for more delicious details. If you've visited our taproom anytime this year, you've noticed we've had all sorts of construction going on. This spring it was a bathroom remodel, and as summer rolled around, we started building a patio in our (former) parking lot. The patio has been unofficially open for several weeks now, but just this week we finally put the finishing touches on the landscaping. It's been quite the undertaking, so it only seems right that we do a proper grand opening. How's this for grand? When we open tomorrow at 3:00, we'll have no less than ten Fultons on tap for your enjoyment in the delightful 79 degree sunny afternoon. Count 'em up: that's every beer we've ever released,* plus one. That means Barrel-aged Libertine, War & Peace, Insurrection, and Expat; Worthy Adversary, Mild, and Ringer; and of course, Sweet Child of Vine and Lonely Blonde. We're even tapping a new black farmhouse ale, which is the latest entry in our small batch Brewer's Series. Fair warning: some of the harder-to-find beers (we're looking at you, Insurrection) will go quickly. *Apart from one-offs such as our taproom-only "Brewers Series" and our Great Lakes collaboration from last fall. If we could go back in time and rescue a keg of each of these, we would. Go ahead and cancel your Saturday plans now, because it's almost guaranteed you'll have more fun hanging out at the festivals our North Loop neighbors are planning. In fact, you may want to cancel your Sunday plans too... First, Smack Shack is throwing Crayfest 2013, and yes, it's what you're hoping for: for a $40 ticket, you get all the crayfish you can eat (featuring Minnesota crayfish), all the beer & hurricanes you can drink, and all the live music you can listen to. The party runs from noon to 8:00, with live music from Year of the Horse, The Devine Collection, Root City Band, Hard Luck and Tambuca. Anytime after 6:00, head just a block down Washington Ave to Cuzzy's parking lot, where North Loop Fest will be taking place until 10:00. In addition to Cuzzy's, North Loop favorites The Loop, JD Hoyt's, and Darby's will be bringning the food, and there will again be enough Fulton to go around. Flash Mob! will be providing the live tunes. Tickets are $15. Also, if you're looking to get a little physical and mental exercise between Saturday's festivities, check out the Twin Cities Urban Dash.